On Saturday, Ann Medlock, of the Giraffe Heroes Project, shared a story on Facebook that prompted me to write this. The article is titled "How Half Of America Lost Its F**king Mind" and was talking about how so many American's are supporting Donald Trump for President. I read the article and encourage you to read it too. If you live in a city, some of the ideas may turn you off, or challenge your thinking. If you live in rural America, or grew up there, you might say, as the author did, "That could be me." 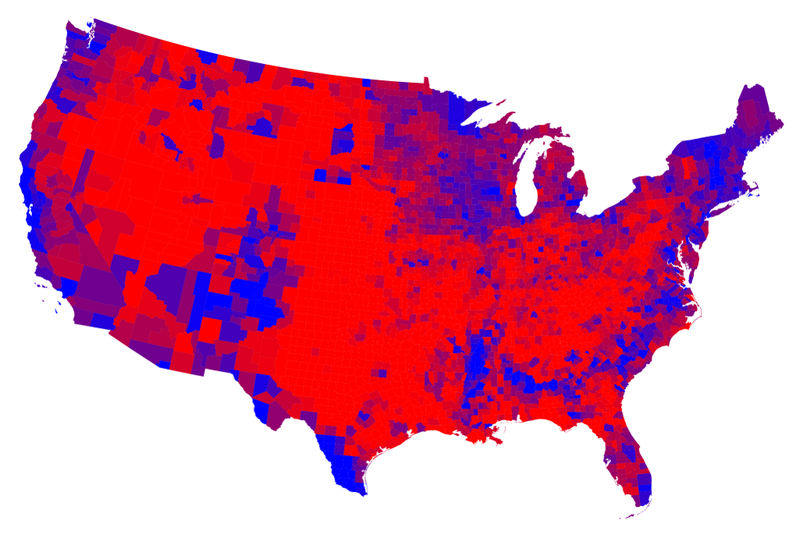 Included in the article was a map showing the 2012 Presidential Election voting, on a county-by county basis. The red counties on this map represent rural, mostly White, America. The blue counties represent urban America, with much larger populations of people of color. Reading the article I began to look at "TWO Americas" from a "rural-urban" perspective, not just from a "White-Minority" or "Rich-Poor" perspective. Of course, they are all related. What's driving the motivation of rural America is a changing economy that has caused factories and jobs to leave smaller cities and rural areas, leaving poverty and a lack of hope in its wake. The article talks about how popular culture (movies, TV, radio, music), coming out of urban Ameria, have helped prepare rural America to accept Trump. One line in the article was, "He's our "asxhxxle"
I did a little more digging today, and visited the web site of Mark Newman There are several more maps on the site, like the one below. This shows that not all of the Red counties are 100% Republican and not all of the Blue counties are 100% Democratic. What this map does not show is the racial mix across America. The article about rural America voting for Trump does not focus on the race and inequality issues that Black American's have been focusing on, yet it's there. 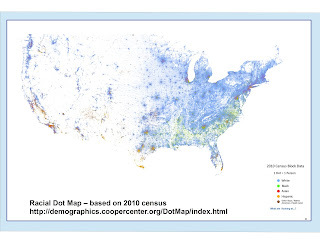 I recalled another web site that I saw a couple of years ago, with what's called a "Racial Dot Map". I've included a screen shot below, showing the full country. The map has color coded dots showing where different racial groups are most concentrated. You will need to open the site and zoom in to get better information from this map, but just by comparing this to the map above, you see two patterns. A large part of the Republican counties East of the Mississippi are high majority White. Cities and urban areas across the country have high minority populations. However, the areas West of the Mississippi, mostly Republican, have very low population density. This is lack of population density is a different rural America than Appalachia and the US South. I encourage you to read Newman's article and see how he describes how population density affects the general election vote, as well as the Electoral College vote. First, the issues of race and poverty in America are complex, and getting consistent attention of people in Red and Blue states will be difficult. For the past 40 years I have focused on helping urban areas build and sustain non-school support systems for youth living in poverty. However, I've recognized that there needs to be a parallel group duplicating my efforts, with a focus on rural areas. I recently found an organization called Rural Assembly, who is doing some of this. Second, the problems facing rural American and its loss of jobs, rising poverty, growing drug abuse and suicide rates is also a wicked problem, that won't be solved by more tutor/mentor programs. It's not a problem I've spent much time thinking about, since the problems I do focus on are far beyond my own area of influence. However, graphics like this illustrate a path toward possible solutions. It shows how a few of us can reach out to others, and build a network of learners, which grows over time. 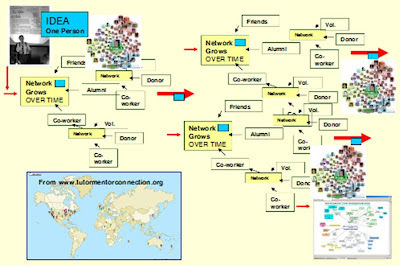 In articles on the Tutor/Mentor blog I focus on learning, complex problems, network building, etc. These do apply to both of the issues this article focuses on. Getting more people personally engaged in learning about the problems we face, and using their own time, talent and dollars to build solutions, is the one strategy that I keep sharing that can lead to a more connected America focusing on problems, not personalities, and focusing on well-thought-out solutions, not vague promises. Note: Jan 27, 2017 update. The election is over and Trump won. People on the left are in panic mode fearing the destruction of our democracy by a Hitler-like Trump. Poor people who voted for Trump are likely to suffer as much, or more, from program cuts he is proposing. So why did they vote for him? This MotherJones article offers a look into that voter and his motivations. For people on the left to create an alternative to Trump, they need to understand and find ways to connect with people who voted for Trump. Note: Jan 31, 2017 update - this Gallup.com site show the most conservative and most liberal states in the US, emphasizing how difficult it will be to build a middle ground consensus in America. 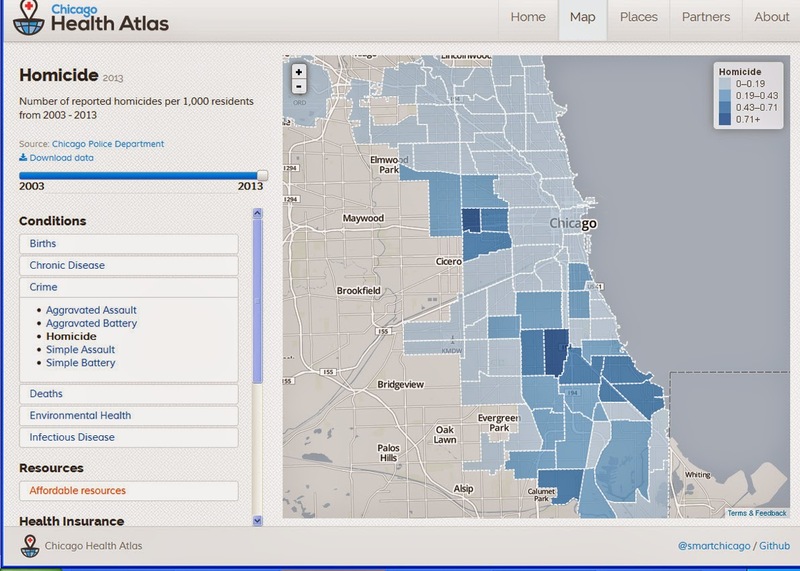 In 2014 I posted this article introducing the Chicago Health Atlas web site. It's part of a series of articles I've posted on this blog, and the Tutor/Mentor blog, showing public health strategies and how they support the growth of non-school tutor/mentor programs in high poverty areas. Today I was able to view a strategic planning document from the Chicago Department of Public Health, as part of the Healthy Chicago 2.0 initiative. It's full of maps and data and shows a goal of generating involvement from all sectors of the Chicago region. What's even better, this initiative is led by a former Cabrini Connections volunteer, Nic Prachand. I have reached out to hospital and public health leaders since the late 1990s to build partnership and strategies that fill neighborhoods around each hospital with a wide range of non-school tutor, mentor and learning programs. I hope I can find a way to have a meaningful role in the Healthy Chicago 2.0 initiative. 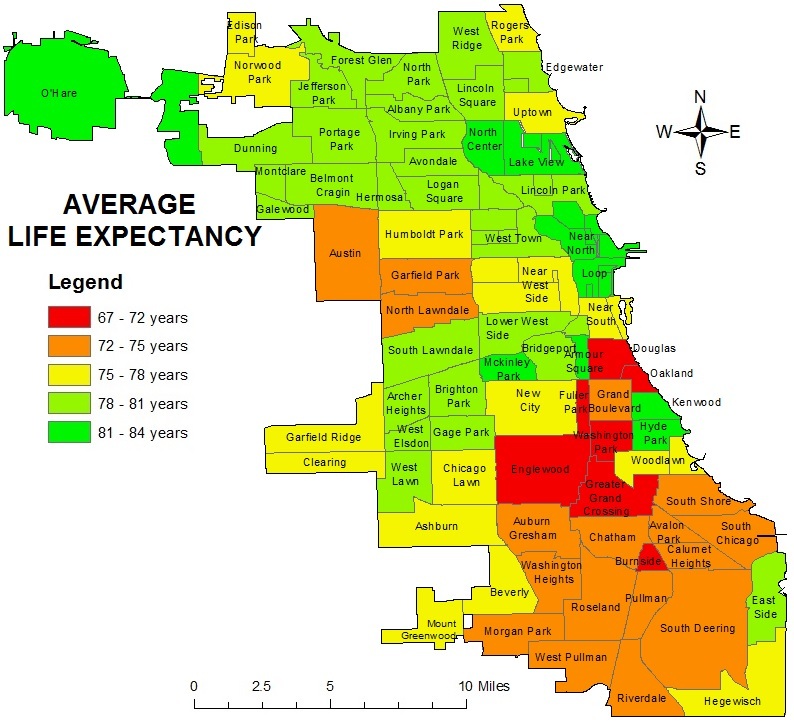 This map is one of many that you can find on a Chicago Life Expectancy web site, compiled by a team from DePaul University in Chicago. These were introduced to myself and a group of others at the monthly ChicagoCityData user group meet-up, held at the Microsoft headquarters in Chicago. Spend some time browsing these maps, then scroll through articles posted on this site, showing other mapping platforms and ways people are turning maps into stories intended to build public awareness, mobilize resources and fill map areas with needed solutions. 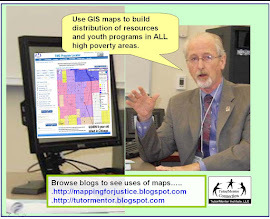 Also visit the links, and you'll find an extensive library of links to other GIS platforms being used in the US and the world to focus attention on areas with high poverty, health disparities, inequality, etc. I was one of nearly 100 people at the meet up, so there's not much opportunity to engage in a deep and on-going conversation with presenters, or other participants. In the Tutor/Mentor blog I've been pointing to cMOOCs, such as the Connected Learning #clmooc, where the format encourages the type of on-going conversation and idea sharing that I feel would be valuable in many sectors. If any readers want to help set up, or sponsor, this type of conversation focused on uses of spatial thinking and tools, or the broader conversations that I focus on, please introduce yourself. 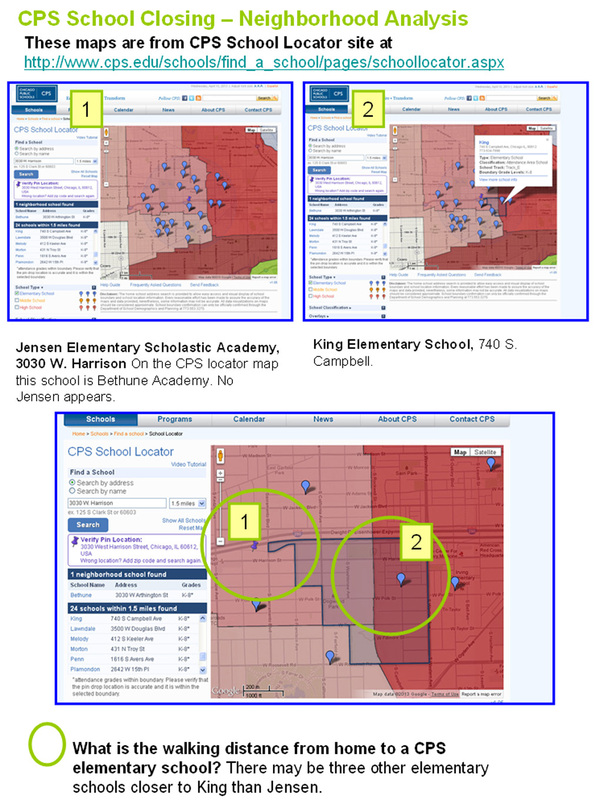 These maps were included in a 2013 blog article talking about a wave of school closings in Chicago. Now The Chicago Reporter web site has an article, along with an interactive map, updating us on the continuing negative impact of these closures. Use these and other maps that you find on this blog to build an understanding of these neighborhoods and ways to help build and sustain a wide range of non-school tutor, mentor, learning and jobs programs in every high poverty neighborhood of the city.